The Panel Properties settings are located in the right-hand frame and are visible when no object is selected (click on any unused space on the display panel). These setting apply only to the active display panel and all objects within that panel. The Embed Content setting is enabled by default. It takes any images used and stores them locally within the presentation file. If you wish the presentation to check for updated versions of these image, check the Reload URLs setting. It utilizes the original Image URLs and if there is no update or it cannot connect it will use the embedded content. 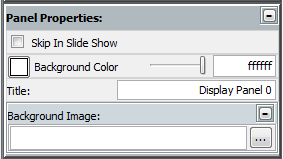 If you do not want a display panel to appear in a presentation, simply check the Skin In Slide Show option. If you want to designate a Background Color other than white for the entire display panel, click on the color box next to Background Color to launch the Color Picker or enter a hexadecimal value into the text box to the right. You can also be adjust the transparency of the color with the slider to the left of the text box. While only visible from within the Presentation Designer and not in a presentation, the Title setting allows you to name a display panel rather than rely on the default naming. This allows you to identify and organize your content. If you have image that you would like to use a background, simply enter the URL into the Background Image text box or navigate to it by clicking on the ellipsis button to the right of the text box. It is recommended that you use an image that is the same size as the display panel. A smaller image will stretch to fit the display panel size, as will an image with a different aspect ratio.